27 Jan 2009 Enter your password to view comments. Matt and I were driving home from one of our many Christmas celebrations last week and as we neared our house I notice a snow blower in someone’s yard with a sign on it that said “$10”. Now I didn’t expect much, but I showed Matt and we thought it was worth looking at for $10. The kids and I wait in the car as Matt talked to the current owner and next I see Matt handing him $10. And so we own our very own snow blower! After the 60+ inches of snow we’ve received, we’ve been longing for a snow blower. However, considering our current employment situation (or lack thereof), this was not a luxury we could have. So seeing this ‘bargain’ for $10 seemed like just the thing for us! Of course, I was wondering how much we would be sinking into this thing to get it to work. The previous owner said it ‘worked last year’, which wasn’t all that comforting to me. But Matt was pretty optimistic. He and Papa worked on it last night and sunk about $5 into the thing plus a little bit of time. And it works! Today was the first day ever Matt was looking forward to clearing the driveway (and probably the last time…this is Michigan after all)! 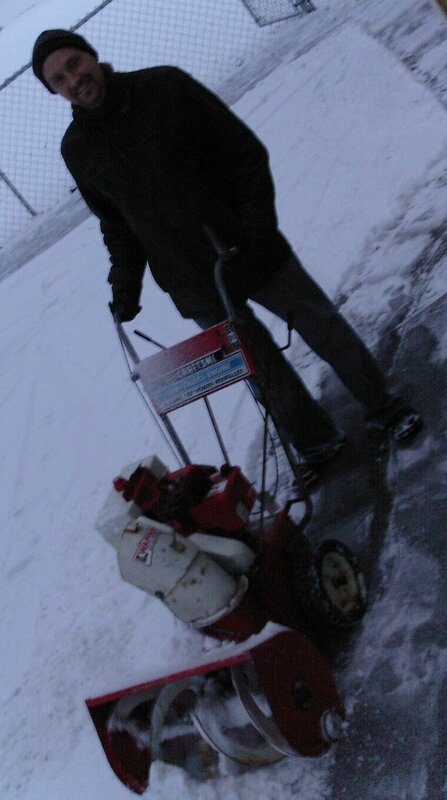 It worked very well and we have a working snow blower for less than $20…now that’s a bargain! 03 Jan 2009 Enter your password to view comments.